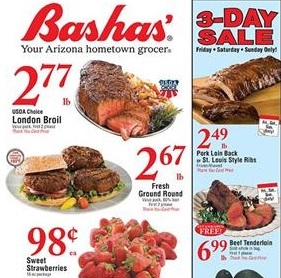 Bashas Weekly Ad Specials, valid April 17 – April 23, 2019. This Week Bashas Ad best deals, and grocery savings on: Thank You Card Price USDA Choice London Broil; Huggies Snug & Dry Diapers; Crusty or Italian Bread or Crusty Baguette; Little Debbie Muffins; Cheerios, Cocoa Puffs, Golden Grahams; Wisk and All Detergent; Cook’s Smoked Ham; Marie Callender’s & Healthy Choice Dinners; Michelina’s Entrées; Tomatoes on the Vine; Pork Country Style Ribs; Shamrock Farms Milk; Blue Bunny Ice Cream; Florida’s Natural Orange Juice; Food Club Potato Chips; Fresh Rockfish Fillets; Assorted Pork Chops; Ball Park Meat Franks and Hillshire Farms Snacking Plates; Beef Tenderloin; Center Cut Pork Chops; Fresh Atlantic Salmon or Halibut Portions; Mangos; and more. Find all deals and offers in the latest Bashas Weekly Ad for your local store.